There aren’t many names in the field of modern, designer board gaming that raise expectations quite like Donald X. Vaccarino. I mean, look at that name – it even has an X in it like he’s some kind of Marvel super villain. Vaccarino is the mastermind behind the perversely popular Dominion, a game that was so unlike anything that had come before that a new genre had to be invented to describe it. He’s a two-time Spiel des Jahres winner. When Donald X. Vaccarino is making a new game, people pay attention. That has to be a lot of pressure. 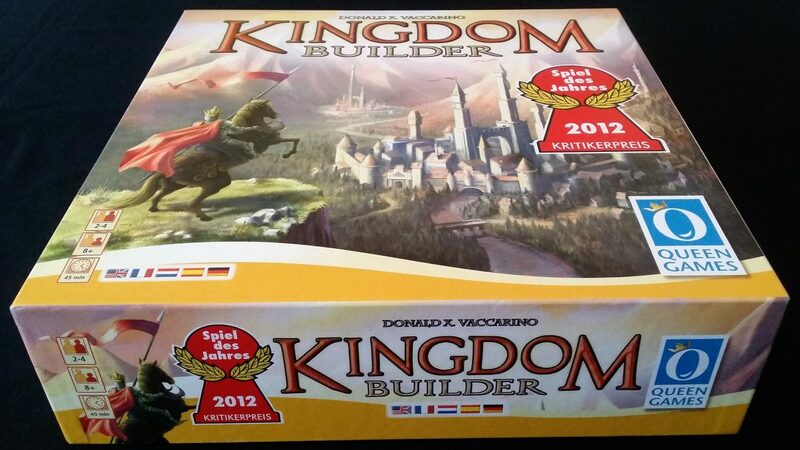 One of those Spiel Des Jahres winners is Kingdom Builder. 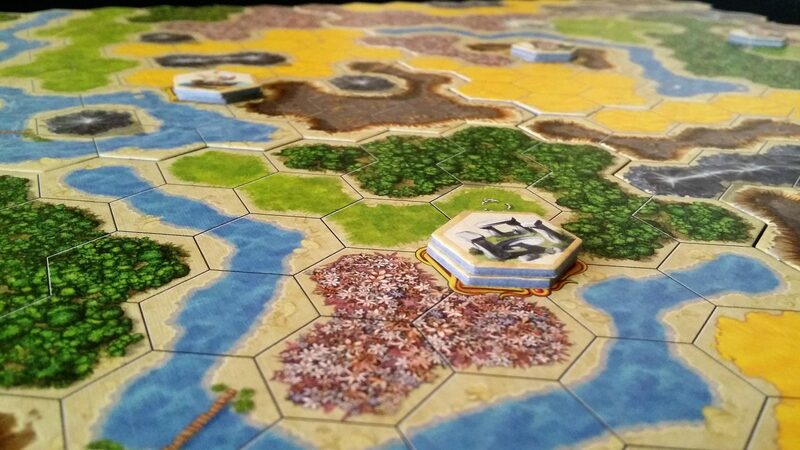 Kingdom Builder is an odd game to follow the pathologically inventive Dominion. Its design is as deferentially safe as Dominion’s was iconoclastically experimental. 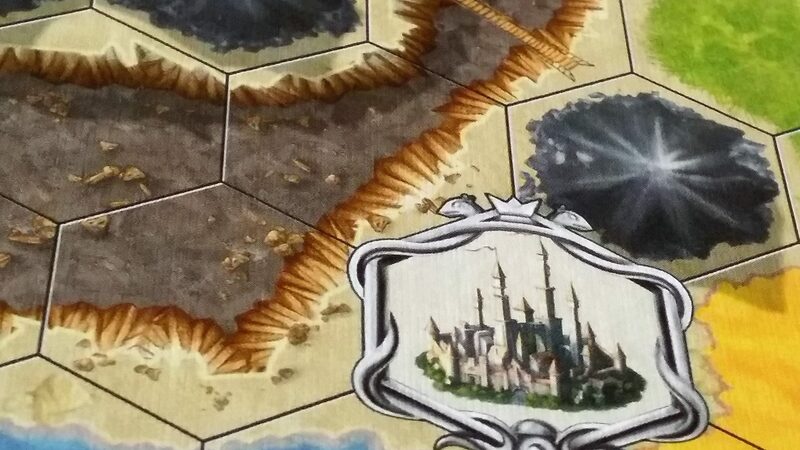 Where Dominion struck out into treacherous seas in search of unexplored territory, Kingdom Builder cleaves to fertile grounds where crops are guaranteed to grow. It is certainly very technically accomplished, as one might expect. It plays with all the smooth assurance of cardboard muzak. Yeah, being compared to muzak isn’t exactly the greatest sign. You can probably guess where this review is going, but let’s talk about how it plays before we get to that. I broke my fingers trying to rifle shuffle these. Unclaimed land. Or at least, unclaimed by anyone that history will remember. So that’s nice! 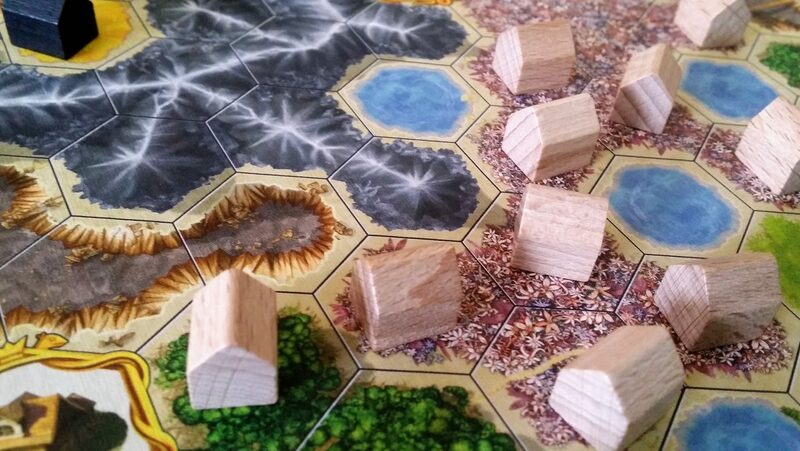 Each of the boards has an approximately equal proportion of the key playable terrains, and a range of other geographical features like rivers, lakes and mountains. 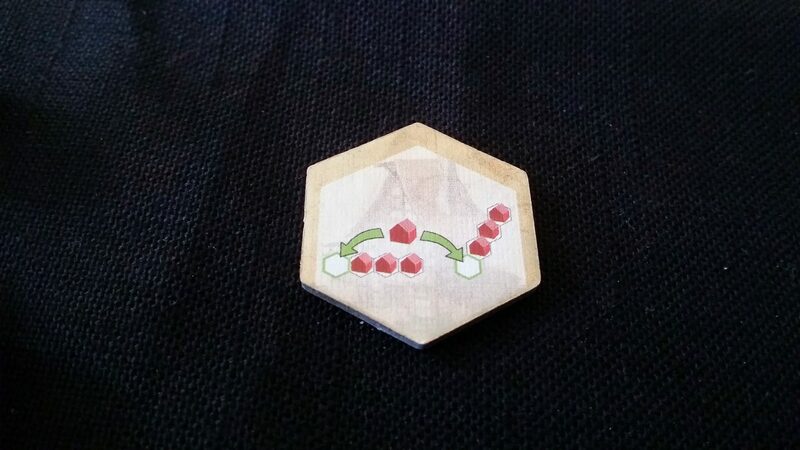 They also put into the game three hexes of special interest. Some of these are castles, which are valuable in terms of end-game scoring. 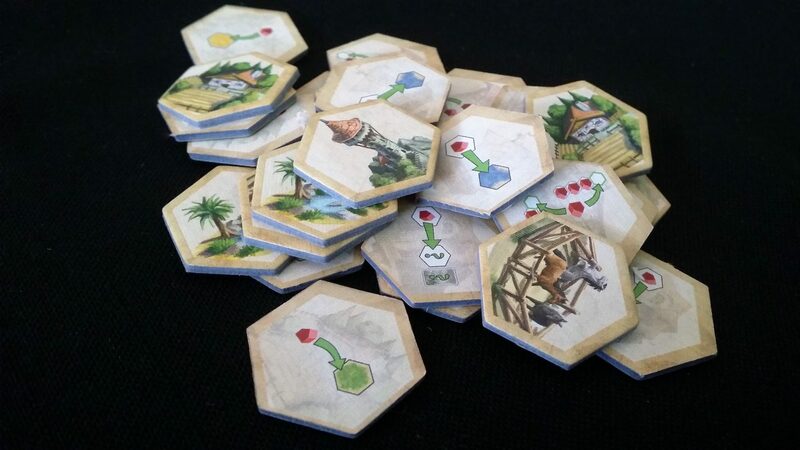 Others are location hexes – these give the player that touches them a special extra action they can perform during each of their turns. There are eight different actions, although only a subset of them will be in any game. 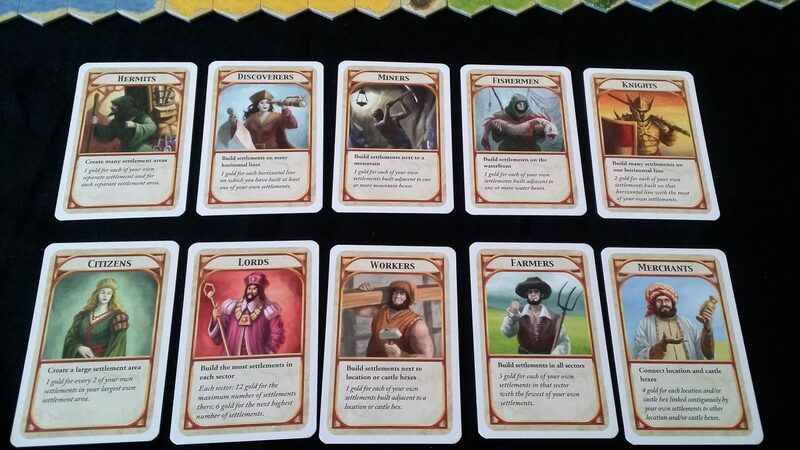 That’s also very nice, and very reminiscent of the card subsets that dominate Dominion setup. You even get reminder tiles in the box that you can slot into the map to show which ones are currently in play. Be careful when you arrange these. If you do it in the wrong way you’ll end up establishing a wormhole to an unknown stargate. Each card is a new adventure! Every game makes use of castles for scoring, but in addition we randomly deal out three Kingdom Builder cards. These become the main vehicle for determining success, or failure. Sometimes the selection of cards will favour one play style, sometimes another. Sometimes these will synergise nicely with location tiles. Sometimes they’ll all be inherently contradictory. It makes the puzzle of gameplay different every time. That is a third nice thing in this box. There are many nice things in Kingdom Builder. It is a nice game. 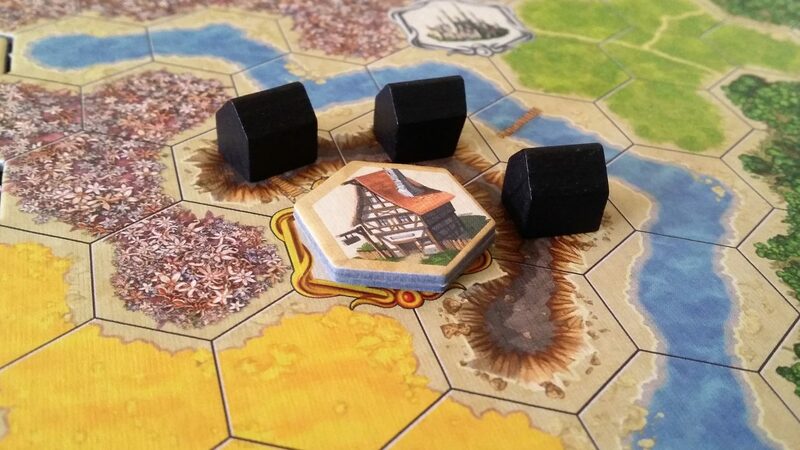 When we construct our map, we place two location tiles on each location hex. 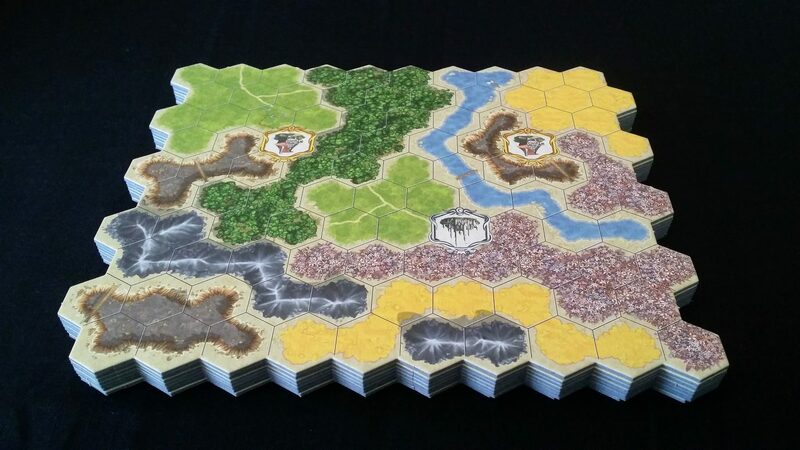 Whenever a player builds a settlement adjacent to one of these, they collect one of the tiles and it becomes a tool they can use to further develop their kingdom. 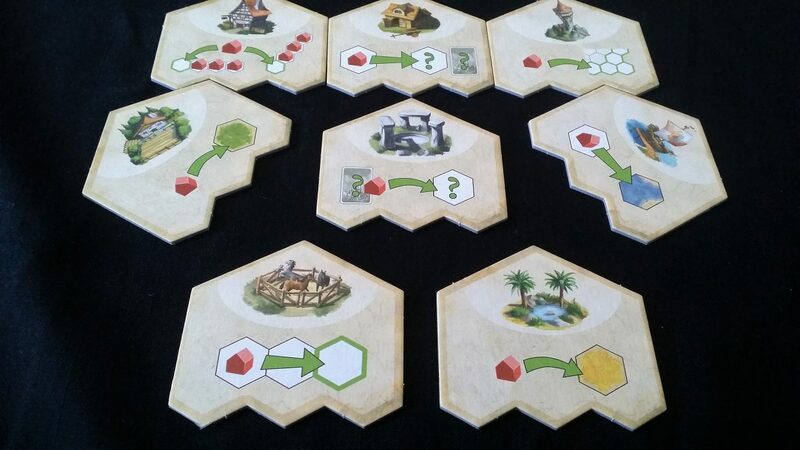 That creates a time pressure, because those tiles are pretty much the only leverage you have over how your kingdom develops – and the more you have, the more levers you can use. You want them before your opponents get them. One day, all of this will be mine. When they’re used up from a location, you can’t claim any more. You can only pick once from any given location per player, but you can double up opportunities by claiming from other sources. There’s a race built into the mechanics to acquire as many of these as possible whilst still working to expand in a way that is compatible with the conditions for victory. We each grab a pile of houses in our chosen colour, and place our scoring marker on the score track. The score track, incidentally, is printed on the back of every single board section. You’ve got four scoring tracks left over once you’ve constructed your map. This strikes me as one of the most bizarre of the things in the game. Printing different map sections on the back seems like it would have been more interesting. Even if you only got seven rather than eight board sections as a result, you’d still end up with almost double the possible landscapes. It’s not a big deal in the slightest, it’s just quite strange. Each player gets forty settlements, and the game ends when the last one has been placed on the board. Placing the settlements is the heart of Kingdom Builder. Every turn, we draw a card from the terrain deck. And then we place three little houses on that terrain type. That’s the entirety of what most rounds involve – this is called the mandatory action, and you have to do it. This might be flashing up all kind of warning lights for you, because it sounds almost unbearably passive. You’re not reading me wrong though. You draw a card, and you play in that terrain. You don’t keep a deck of cards. You don’t draw and select. The game tells you ‘build here’ and build there you will. Don’t worry though, it’s cleverer than it sounds. Only one settlement many be built on any hex. 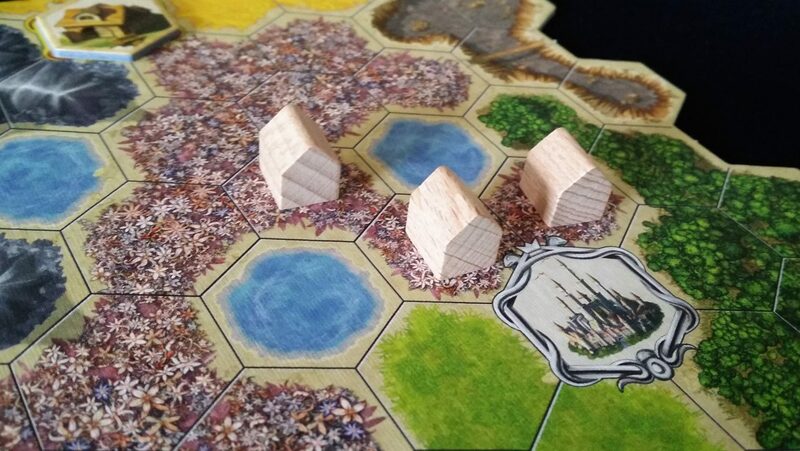 Only five types of hexes are valid for placing settlements. You must build adjacent to your existing settlements if possible. 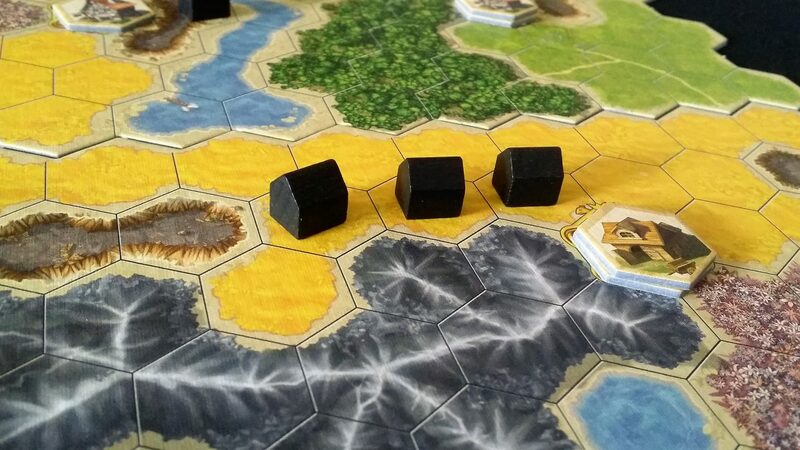 You know the three things that matter in Kingdom Builder. The first is location. We could build next to a castle – we’ll get three points at the end of the game for each castle where we have an adjacent settlement. It’s not a lot in the grand scheme of things, but it’s not to be sniffed at. We wouldn’t get an extra action, but we could certainly limit our adjacent terrain options. That would let us claim a tavern, but at the expense of being adjacent to both forest and grassland. After all, we need to build three in the matching terrain. There’s no way to swing that in a way that won’t leave us with two adjacent terrains. 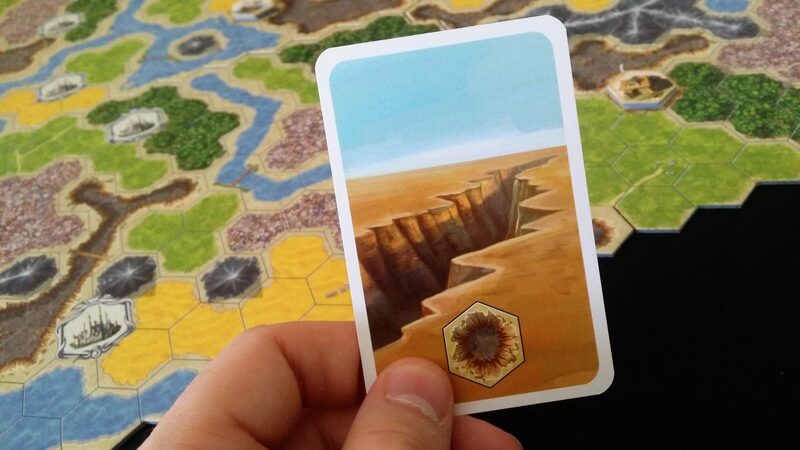 We’ll be statistically unlikely to draw a card that would let us pick a far-flung location for our next settlements. So, which do we pick? That’s going to be a decision with huge ramifications, so we’d best choose wisely. I chose this area primarily because of its broadband connectivity. 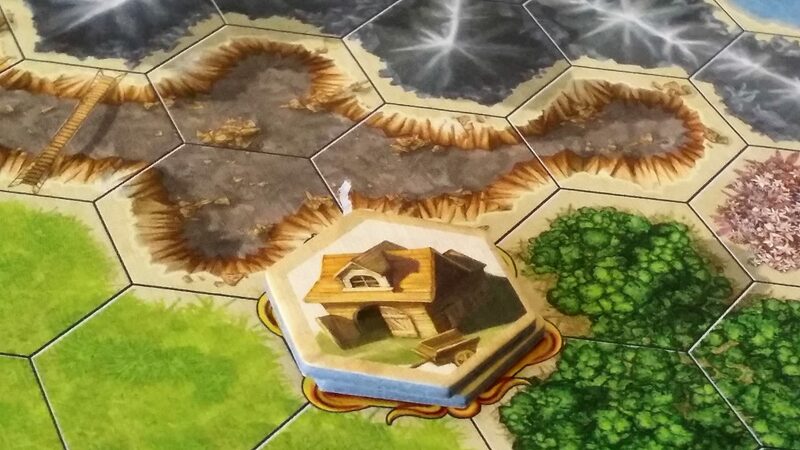 We go for the SECRET FOURTH OPTION – we’re now adjacent to a field of flowers, but we can’t be forced to build on river tiles, and we have only one remaining canyon hex. There are five different terrains in the game. If our next draw isn’t a flower field, we’ll be able to set up settlements elsewhere and exploit new natural resources. That’s pretty great. Turn it around three times and it summons an elder god of your choice. You wouldn’t necessarily know it from the occult iconographic language at use here, but it means that every turn we can optionally choose to place a house at the end of a straight line of at least three settlements. 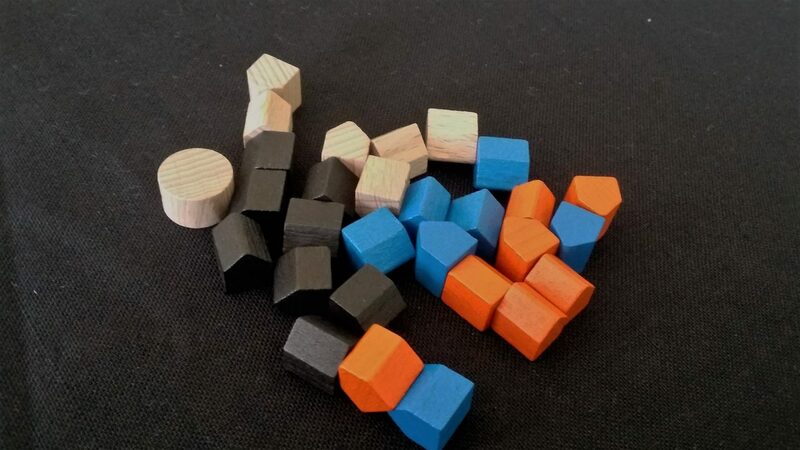 These actions are the key mechanic that gives us flexibility In Kingdom Builder – we need to build up our toolkit of special abilities to limit the impact of the otherwise inexorable inevitability of the terrain cards. We need to wait until our next turn before we can do this, but turns in Kingdom Builder are very quick. 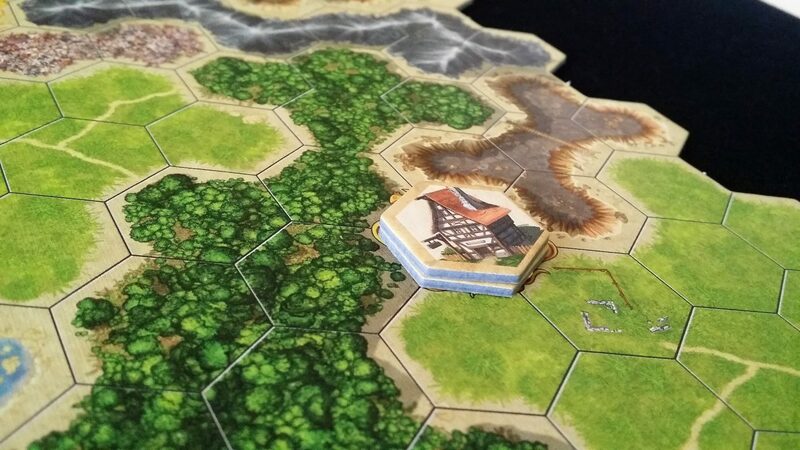 Player two draws a forest tile, and follows the same thought process – attempting to minimise exposure to terrain while maximising the benefit of player settlements. They don’t do it quite so well though. This play gives access to the oracle special action. That action allows you to play a fourth settlement on the same terrain type as you just drew. Not hugely useful in many circumstances, but if you’re playing a game that stresses large settlements or suburban sprawl, it can be powerful. Unfortunately, in the process player two has opened themselves up to three adjacent terrains. Striking out is going to be a lot more difficult. 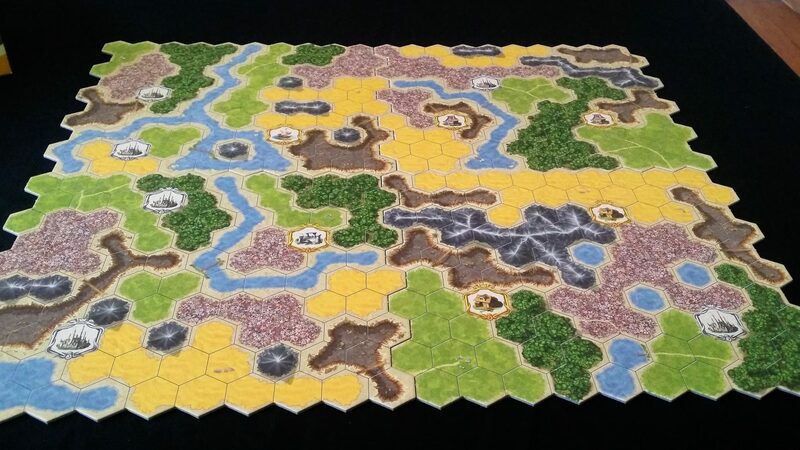 Player one draws grassland, and with no adjacent terrain the settlements can be played on any matching terrain, anywhere on the board: Remember too that every settlement you place is a scoring opportunity. Player one goes for some nice coastal land to maximise benefit from the fishermen scoring condition. In the process, he claims the second of the oracle actions. His previously collected special action isn’t useful here though – it’s not possible to build onto location hexes, or into rivers without the benefit of a harbour special action. 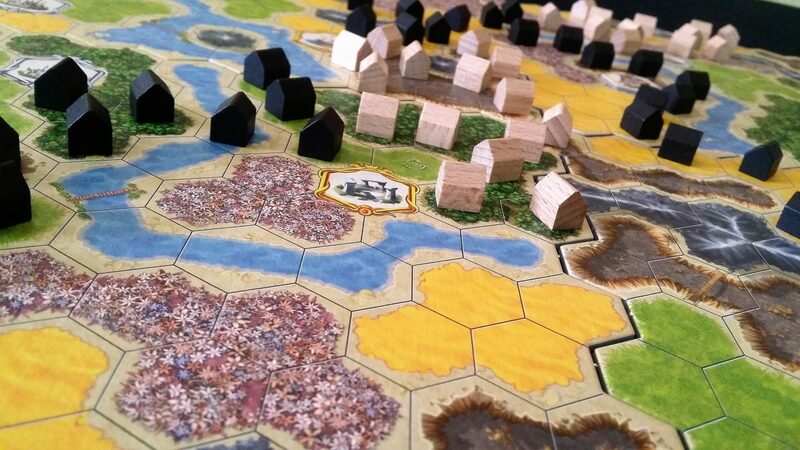 But never mind – Kingdom Builder is a game of maximising opportunities over the long term. Just because you can do something, it doesn’t mean it’s a good idea. Player two draws a second forest card. This is bad news, because there’s plenty of adjacent forest to expand into. She has to do just that, trying to limit the opportunity cost by at least building around the mountain to gain the miner scoring bonus. Player one gets lucky once more and draws a desert. There’s no adjacent desert terrain, so that’s yet another grouping of settlements that can be cast out into the wider expanse of the map. Has anyone seen a flying machine around about here? That’ll get him another barn option, and scoring from the adjacent mountain. Player two draws a flower field and finally gets to break out of the forest into somewhere new. You can see what I mean, I’m sure, about how fundamentally safe a design it is. Paul Dean, of Shut up and Sit Down, perfectly summed it up for me as ‘Kingdom Builder is the textbook definition of quite nice’. Really, that alone is the perfect review but I’m not going to stop talking just because the point has been made. I’m an academic. We don’t do that. I can see Kingdom Builder being a game that almost everyone can enjoy. It’s quick, it’s involving, and it has enough variety in play to keep people coming back. Those scoring conditions aren’t just alterations in the arithmetic of victory – they fundamentally alter the dynamics of placement. Look at the final state above – see how the settlements follow rivers, and congregate around mountains? See how there are vast expanses of untouched land? 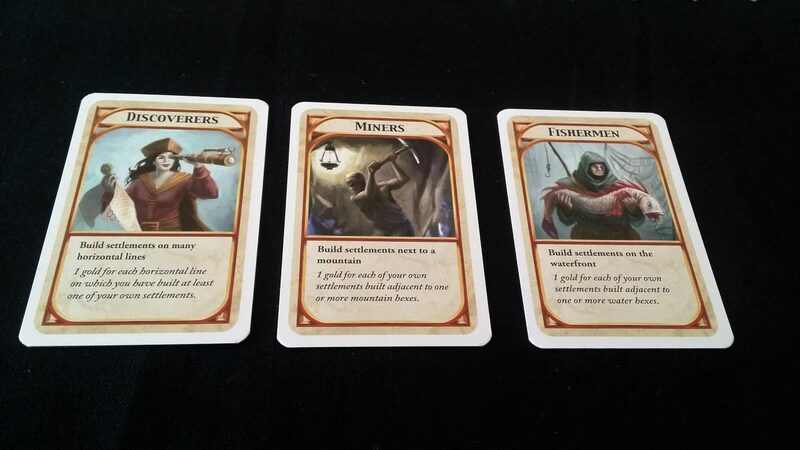 The Kingdom Builder cards create an economy which fundamentally alters the value of every hex in the game. Look at the settlement on the right on the image above. It’s adjacent to a river, which is a victory point. It’s also adjacent to a mountain, which is another victory point. That’s real value. It’s also adjacent to a canyon, which is a good thing or a bad thing depending on the stage of the game. Early on you want to ensure that building forces you to start new colonies elsewhere on the map. You want to minimise terrain adjacency. As time goes by, that inverts – you want maximum terrain adjacency to give yourself options once new colonies are not a possibility. The value of every tile shifts as time goes by and as other players block your path to maximum benefit. Every single settlement is placed on the scoring equivalent of shifting sands. As you select hexes, you change the value of every other one in the game. And in every game, you’ll have a different map, and different scoring, and different extra actions. It’s intensely clever, and it presents to the players a deep, satisfying puzzle. And the more players you have, the more intensely clever that puzzle becomes. So yeah, I can definitely see this being a game that would have a great number of admirers. I don’t see it being a game that is likely to have a large number of passionate advocates. The design is pure, yes – and as a result it has the off-putting scent of sterility lingering about its tiles. It’s a game that is played very much with the head, with the heart only begrudgingly along for the ride. There are no great moments in Kingdom Builder – you never make a play that is so deeply satisfying that you can’t help but make a celebratory fist. I found in my plays of Kingdom Builder that while I appreciated the cleverness of the game, it never made me feel particularly clever for playing. 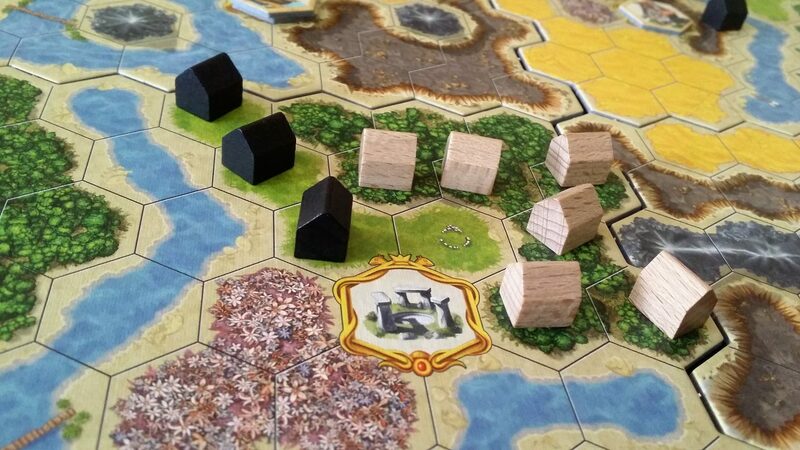 I got the feeling that if it were possible for Kingdom Builder to play itself, it wouldn’t sully its algorithmic perfection with the likes of me. 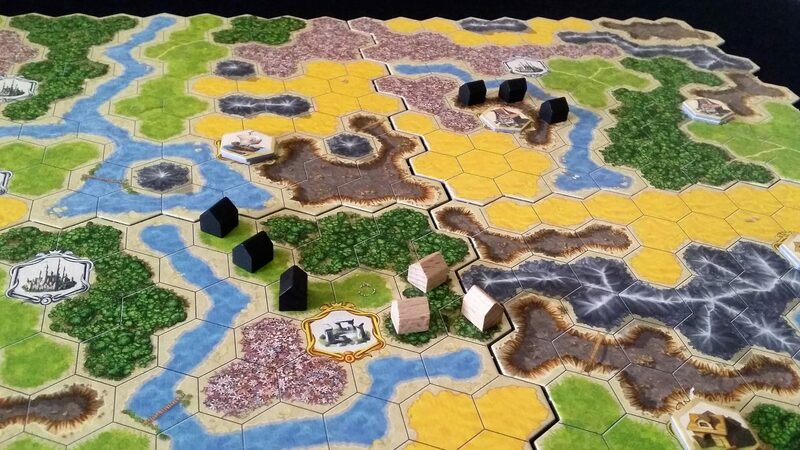 It’s the board gaming equivalent of a screensaver that hasn’t quite worked out how to run by itself. Looking around my shelves, my eyes rest on dozens of games that make me think ‘Oh god, I need to find the time to play that again’, or ‘I am really excited about playing that for the first time’. 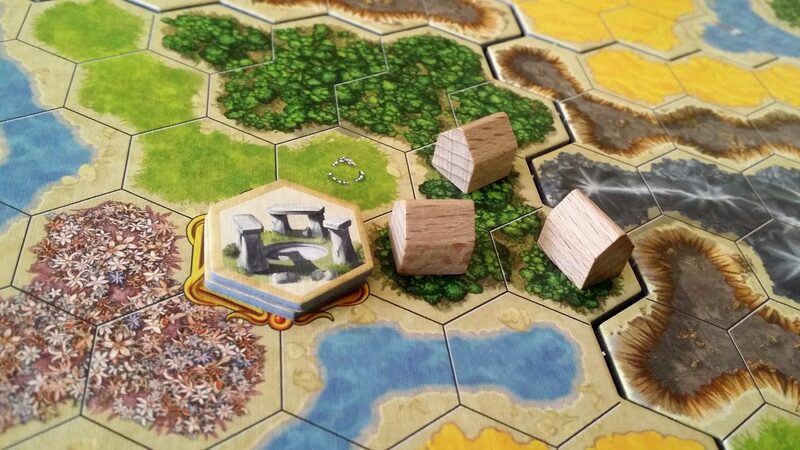 When I look at Kingdom Builder I think ‘Well, if someone suggested it I probably wouldn’t say no’. It’s a good game. It’s a solid game. It’s a game I have enjoyed every time I’ve played it. And I don’t think I’d even notice its absence if someone stole it during the night.